Sri Lankan Ambassador to the Russian Federation, Dr. Dayan Jayatilleka and Ambassador of the Republic of the Union Myanmar to the Russian Federation, Ko Ko Shein. 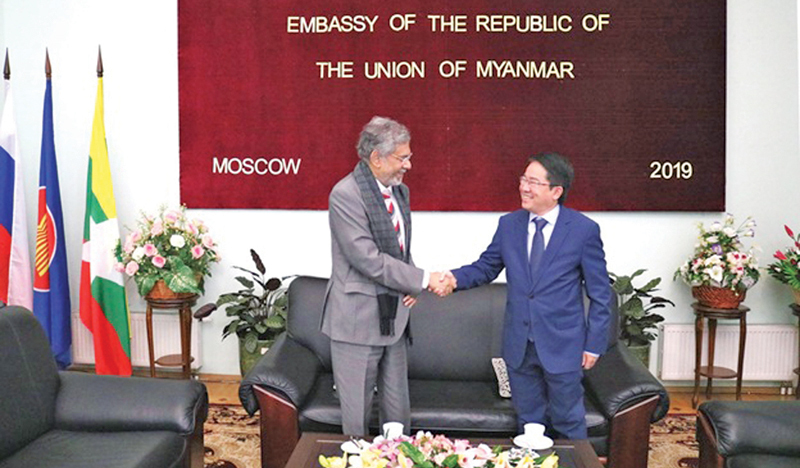 Sri Lankan Ambassador to the Russian Federation, Dr. Dayan Jayatilleka paid a visit to Ambassador of the Republic of the Union Myanmar to the Russian Federation, Ko Ko Shein, yesterday. Ambassador Ko Ko Shein has received four medals of honour during his career. The Ambassadors spoke about the background to the current political and human rights situation in the Republic of the Union of Myanmar, the biases of the Western media, the importance of the constructive role of ASEAN in the region and the adherence of Myanmar to a neutral position in the matters pertaining to the military-strategic aspect of the Indo-Pacific concept.